The only Thai food I know of and have tasted is Pad Thai, or the stir-fried noodles, and their Satay, or grilled skewered meat similar to the Pinoy barbecue you can find in almost every other corner on highly-populated streets in the metro. I believe Thai food is similar to Filipino food—just substitute white rice to rice noodles. Honestly, I’m pretty much in the dark, so I thought it would be an eye-opening experience despite seeing the menu beforehand and learning of the extravagant prices. Anyway, their menu is hard to pronounce, but they were described in a way that is easy to understand. My suspicions were half true, as there were plenty of dishes similar to Filipino food and a lot of rice noodle dishes. The other half shown that they still have a lot of stir-fried rice variations and curry. 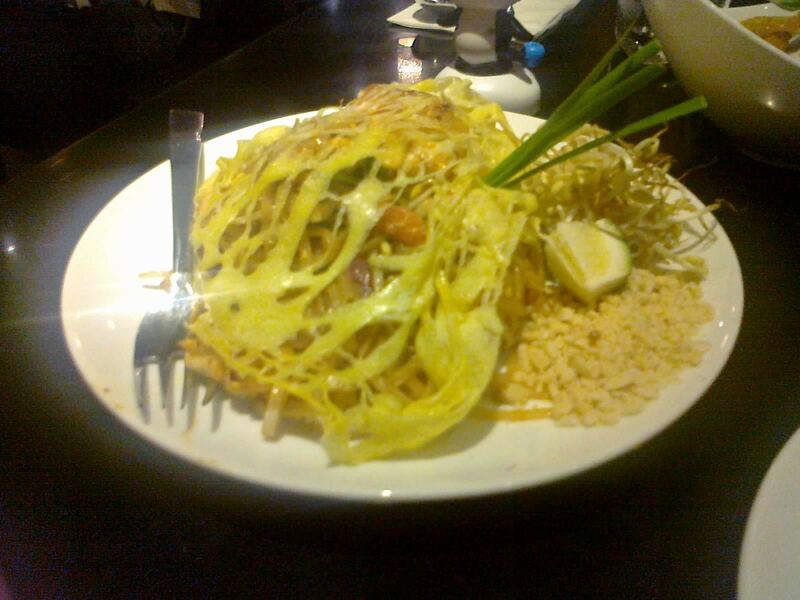 Because I thought it was a safe choice, we ordered their Pad Thai Goong (350 Php), which is stir-fried noodles with prawns. Our main viand choice is their beef curry—the Gaeng Ped Nua (380 Php). 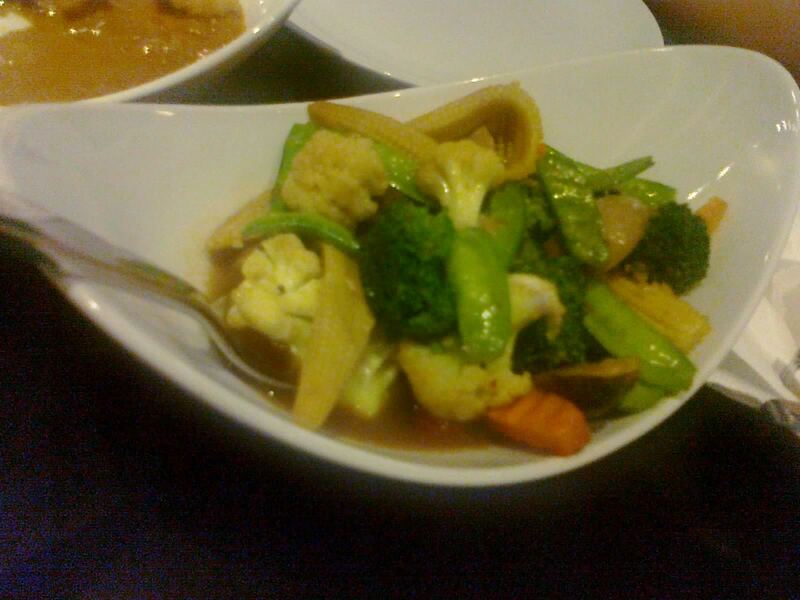 Finally, we also asked for a plate of their Pad Phak Ruam Mitr (180 Php), or stir-fried veggies. Because all our orders arrived at once, I’ll start with the Pad Thai Goong. It was a pretty presentation—webbed scrambled egg covering the rice noodles, tofu, and prawns with bean sprouts and crushed peanuts on the side and topped with a sprig of lemongrass. The amount in it was pretty much good for two. In addition, they gave us four shot glasses filled with different condiments—sugar, vinegar, fish sauce, and chili flakes. It was pretty tasty alone, but adding a scoop of each of the condiment makes for a treat of practically all possible flavors. My criticism to this plate is that it only has three small prawns, and I would’ve wanted more especially with the amount they charged it. The Gaeng Ped Nua is hot! I found it similar to Indian curry, especially with the coconut milk mixed in. It was a pretty foreign experience, especially us being used to the non-milky Japanese curry rice. You know, I guess we should’ve ordered rice instead, as it didn’t really mix well with the Pad Thai, which could have been a meal in itself. Anyway, other than the beef, there were also assorted vegetables mixed in, but I couldn’t tell which is which as everything is covered in the spicy bath. Finally, there’s the Pad Phak Ruam Mitr. This one’s basically chop suey. There were green beans, carrots, baby corn, broccoli, mushrooms, and cauliflower. You know, I’m out of things to say about this dish. If you’ve tasted some variation of chop suey before, then you’ve tasted this one. It’s not bad. In the end, we had happy tongues, barely satisfied stomachs, and very sad wallets. To be honest, I wasn’t as filled up as I hoped a 1000 Php dinner would have. When the coconut milk from the curry kicked into my Beloved’s lactose-intolerant stomach, it turned sad as well. However, I must admit that none of the food we had was bad. In fact, I found the Pad Thai very good. 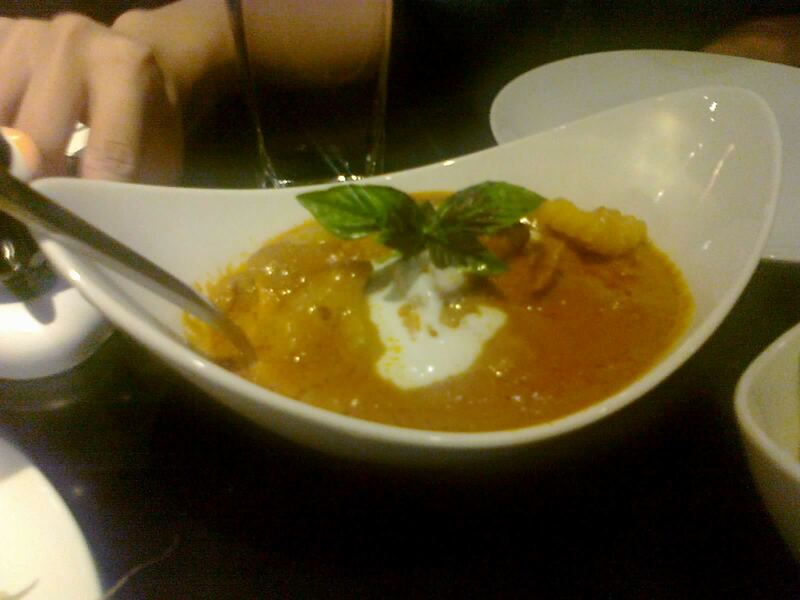 The curry was okay as well and I guarantee it to be a treat for spicy food lovers. The chop suey did its job and perhaps is the most justifiable one with its price. The other two I would’ve priced much lower even if they were able to feed two. Then again, Thai food is a rarity, and this one is the most accessible for me in the Metro. Until I can go out more and try other Thai restos, this still warrants a passing grade from me despite their somewhat eyebrow-raising price tag. Smart nomnomnom tip: More people = more orders = more variety.